I thought I would tell the parents out there about a fun book and CD Cate received as a gift from one of Nate’s aunts. 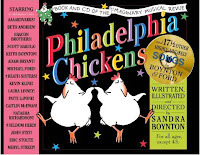 It’s called Philadelphia Chickens by Sandra Boynton. There’s one word that describes it perfectly: SILLY. And your kids will love it! 🙂 Also, if you’ve ever read “The Belly Button Book” by Sandra Boynton, you finally get to hear how the belly button song goes. I’m sure you’ve been dying to know. Sorry to the non-parents out there…promise I’ll get back on food for the next post! Click here for the MP3 album version. Hey everyone, no cute picture today…plus, I don’t know that a glob of trans fats would be very appetizing to look at! I’ve been on the anti-trans fats crusade for about 10 years. I was so happy when the FDA finally required food labels to include trans fats in 2006. I just read about a little glitch in the system, however, that I wanted to share with you. As long as the serving size has less than 0.5 grams of trans fats, they can put 0 g on the label and say there’s no trans fats. Granted, 0.5 g isn’t a lot, but if you’re eating more than one serving, it adds up. And you really don’t want any in your system anyway, no matter how small the amount. Lesson learned: check the ingredients list as well as the nutritional label. If it says ‘hydrogenated’ or ‘partially hydrogenated’ anywhere, then you’ve got trans fats. Don’t eat it! Why are trans fats so bad? Like saturated fats, they raise your bad cholesterol. However, trans fats take it one step further and actually LOWER your good cholesterol, something saturated fats don’t do. Ah, the wonders of modern science. If you have a choice between a spread or real butter, go with real butter. It will do less damage and your body knows how to process the natural foods much better. Gotta love all of our processed foods out there. Geesh. You’ll see my plan for Sunday is the same this week…that’s because tonight we’re actually having pork soft tacos, the pork compliments of my Aunt Sue who was in town this week. 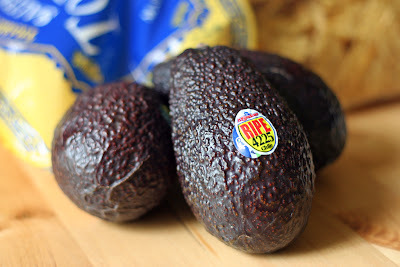 She cooked it in the crock pot with some chile powder and fresh lime juice – came out delicious! Beans, rice & guacamole are also on the menu. – Pool Party at some friends’…just have to do veggies & dip! This is my final roadtrip post from this summer’s fantastic east coast trip. I can’t believe I’ve been home for nearly 2 weeks and am still writing about the trip – amazing how much blog post fodder I collected! I thought I would end with one of my most favorite Boston spots. Modern Pastry in the North End (the “little Italy” of Boston). Not only is it just a great, authentic Italian bakery, but they do in fact make the best cannoli in Boston, and, perhaps, the U.S. as I’ve yet to find one better. I LOVE CANNOLI. And, like bagels, I’ve gotten a little picky about my cannoli. Modern Pastry does not disappoint. My favorite: Plain shell, ricotta filling, chocolate chips sprinkled on the end. For some reason I was able to overcome the almost irresistible urge to make a trip up to Boston solely for a cannoli…I still don’t know how I did it. 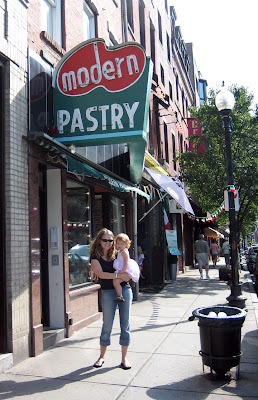 This picture is from last summer – Cate’s first visit to Modern and her first taste of cannoli, which she loved. She IS her mother’s daughter. Want to see Modern Pastry in all it’s Italian glory? Go the day before Thanksgiving. You won’t hear any English and the line will be out the door with little Italian ladies picking up their pre-ordered Thanksgiving desserts. So much fun to watch. Ah, the bagel. When done right, they are soooooooo good. When done wrong, fahgeddaboudit. New York and New Jersey have cornered the market on good, real bagels. Once you’ve had a REAL bagel, there’s no going back. I know, I know – you’re got this bagel shop down the street in your town that is just GREAT. Eh, if it’s not in the tri-state area, I probably can’t believe you. How do you know it’s a real bagel? Well, first off you probably have to be in NY or NJ – sorry to everywhere else! Second, it’s got this awesome crispy outside…geez, don’t even know if that’s the right description, but you’ll know what I mean when you eat it. Lastly, the inside is chewy and NON-bready. Bready = Bad. Chewy = Good. I had a delectable bagel from Chester Bagel & Deli on my last day out East. Chester is the next town over from where I grew up. 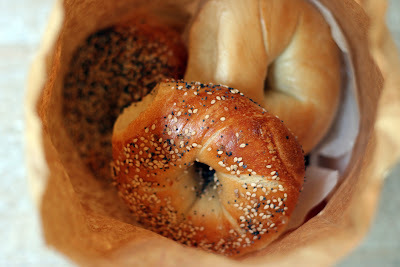 These bagels were perfect, just what I needed to get my bagel fix. It’s a good thing we got them the last day or I would have eaten FAR more than would have been good for me. While we’re talking bagels, I feel it my obligation to share with you the source of the best bagels in the world: H&H Bagels. They’re the best bagels in NYC, and since NYC has the best bagels, well, that makes them the best in the world. Every time you go to NYC you must be sure to swing by H&H. They do ship anywhere in the world, but there’s nothing like getting it straight out of their ovens. Disclaimer: Just because a bagel is in NY or NJ does not automatically make it good. I had a TERRIBLE bagel my first day in Jersey. You have GOT to go to the right spots!!! 🙂 This post is a BIT long…perhaps I’m a BIT obsessed? Ever wondered what you might find in scenic Buttzville, New Jersey? Why Hot Dog Johnny’s, of course! Our last night in NJ we took a beautiful drive up to Buttzville (yes, that really is the name of the town, and yes, it is a TINY town, and yes, they have a post office) to have dinner at the famous Hot Dog Johnny’s. They don’t have a menu. We asked, silly us. The menu is hot dogs and french fries – duh, you city-folk customers. The hot dogs (cooked in peanut oil) are only $1 – you can’t even make a hot dog at home for $1! The french fries were yummy. You can also get drinks – soda, birch beer (kinda like root beer), fresh buttermilk – and ice cream. It’s a fun place to go and it really is in a beautiful spot by the Pequest River. Already time to plan another menu? Time is flying by too fast…before I know it I’ll have another baby! Here goes…and please share your menus – remember, it doesn’t need to be fancy! So, I went into Long Valley (my humble hometown) to prove to you the abundance of Italian and pizza joints. I clocked the mileage from Long Valley Pizza (Italian restaurant #1) to Salerno’s (Italian restaurant #4 and home to AWESOME garlic bread knots)…1/10 of a mile. That’s right FOUR Italian/pizza restaurants in 1/10 of a mile. If I expanded the mileage to about 3/10 of a mile, it would have been five! The funniest part is THIS is the view across the street. Okay, so there are more than just fields in Long Valley, but the 15,000 or so people who live in this town have kept these restaurants open for years. 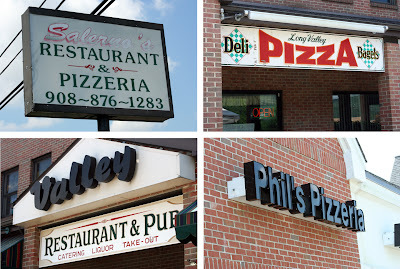 If you took away the Italian restaurants, the better part of NJ would starve. 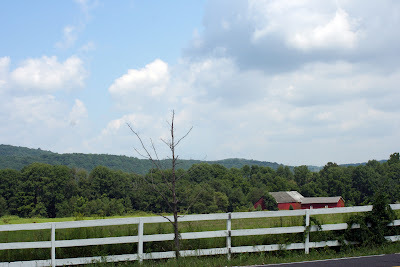 And my town isn’t the only one – we drove west through some VERY small NJ towns, and even THEN we passed Italian restaurant after Italian restaurant….out in the middle of NOWHERE. There MAY be a reason for the overabundance of diners and Italian restaurants…but I don’t want Tony Soprano coming after me, so I’ll just stop here. Our last stop on the East Coast tour was New Jersey. New Jersey gets a bad rap, but it is, after all, the ‘Garden State,’ and if you can get yourself beyond the Turnpike and the Newark Airport, you’ll realize the nickname really does apply! Cate and I are HOME. After a crazy morning in JFK airport, our first flight on JetBlue went great…gotta love the TVs and the fact that Cate slept for 2 1/2 hours. Our trip East was loads of fun and I’m so glad we went, but it is nice to unpack and settle back home. I still have a bunch of Roadtrip posts for you, which is a good thing since my cooking this week won’t be very spectacular. Today is the last Cape Cod spot and probably one of my favorite places we go every year. Our Cape weeks always start on Saturday…we generally go down, get the key to the cottage, then pick up some pizza at Sweet Tomatoes. Oh man, this pizza is GOOD. VERY thin, awesome tomato sauce, so tasty. This year we got hawaiian (my favorite) and greek (also great). Cate beat everyone and ate FIVE slices. No one has ever accused that girl of being a bad eater.